Boeing Starts Assembly of Final KC-46A Test Aircraft . Boeing is assembling the fourth and final KC-46A test aircraft for the U.S. Air Force’s next-generation aerial refueling tanker program at the company’s Everett factory, keeping the program on track to deliver the initial 18 tankers to the Air Force by 2017. The aircraft are commercial derivatives of the Boeing 767 jetliner; their design features aerial refueling capabilities that will be installed later at Boeing Field in Seattle. The 767 is a proven jet in service as an airliner, freighter and international tanker, with more than 1,060 delivered worldwide. 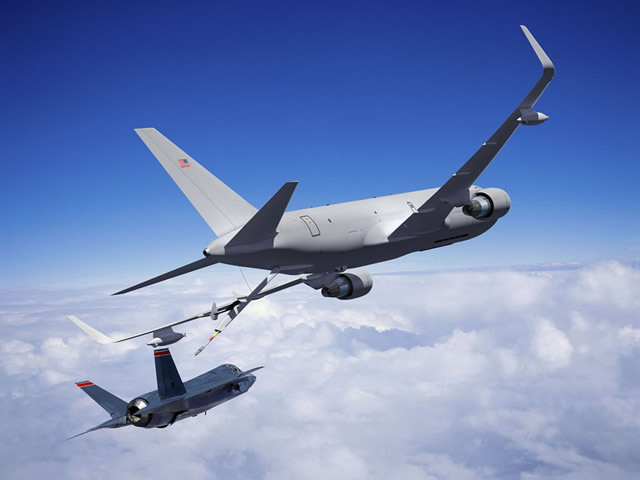 The first flight of an Engineering and Manufacturing Development KC-46 tanker program test aircraft, without its aerial refueling systems, will take place at midyear, followed by the first flight of a KC-46A tanker in early 2015. The first delivery of a production aircraft to the Air Force is planned for early 2016. Boeing expects to build 179 tankers by 2027 if all options under the contract are exercised.